Many people complain of the cellular network not available on iPhone after they upgrade to iOS 9 version. This happened to several people, with a reason being a software bug in the over-the-air update. But there’s no reason to worry as there’s no hardware issue. When cellular network not available on iPhone problem arises, you may not be able to connect to the internet via 4G LTE or 3G. Most apps will not connect to the web, and the Cellular Data button could be gray inside the connection settings, as in an inactive button that can’t be activated. Follow these steps to fix cellular data not working on iPhone. 1. Update to New iOS: Apple has the latest iOS 10 and above update. They’ve fixed the cellular network not available on iPhone bug that prevented the establishment of 4G, 3g or 2G TE channels. Do an OTA update using you WiFi. Advanced users can select complicated ways by downloading .ipsw files to upgrade firmware. 2. Activate Cellular Data: The button may not gray out. If you don’t know, ensure the cellular data is switched on. Head to Settings -> Cellular and toggle switch Cellular Data which should go green if not grayed out. Scroll down to settings and ensure all apps are given permission to leverage cellular data. Go out, and check if the device is now connected. It should work well if there is no bug. 3. Create a new APN: Cellular network not available on iPhone can be fixed with a new carrier APN. Follow these steps for the purpose. Select the country and operator. Tap “Create APN” for APN installation. Try activating cellular network now. 4. Update Carrier Settings: Did you know that cellular network service providers also offer updates to resolve conflicts between network connectivity settings and iOS settings? In instances like these there would be cellular updates in Settings -> General -> About. Installation should be carried out if there is one. 5. Reset Network Settings: Resetting the network of the device to its factory settings could resolve the issue of the cellular network not available on iPhone. This isn’t factory reset; the step just reinstates the network settings to the initial stage. Go to Settings -> General -> Reset and tap “Reset Network Settings” – you may see a dialog box for user verification. Enter the password and the setting will be cleared including WiFi passwords. 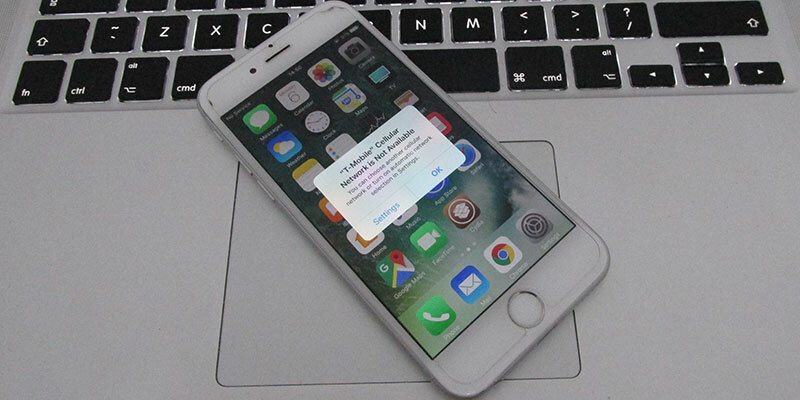 Enter your network credentials after the iPhone restarts. Once you’re done with these steps, you’ll hopefully solve the problem of the cellular network not available on iPhone.